Husbands Bosworth Church is in the Market Harborough Methodist Circuit, within the Northampton District. Services are normally held at the chapel 4:30 pm every other Sunday (on alternate Sundays we join with All Saints Parish Church or one of the other Circuit Churches), see the Circuit Plan for more details. For our safeguarding policy, please see Market Harborough Safeguarding Policy 2018. Address: Husbands Bosworth Methodist Church, Welford Road, Husbands Bosworth, LE17 6JX. 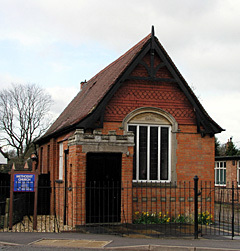 The Chapel is situated on the right side of Welford Road next door to the Village Hall, about 50 yards from the junction of Welford Road and High St and opposite the Village School. To proclaim the Christian faith by worship, fellowship and service. A Bible Study meets once a month on Sunday evenings and a Coffee morning is held monthly in the home of Lloyd Jones. Circuit Service, 4:30 pm at the Methodist Chapel. A closing service for the chapel, led by District Chair Rev. Canon Helen Cameron, celebrating over 100 years of worship at Husbands Bosworth.